The Breakdown: Will States Lead on Single-Payer Healthcare Reform? The Washington Post's Ezra Klein joins Chris Hayes to discuss whether a new bipartisan proposal in the Senate could pave the way for states to adopt single-payer healthcare systems. Senators Ron Wyden (D-Ore) and Scott Brown (R-Mass) have proposed a bipartisan amendment to the healthcare bill that would allow states to create an alternative healthcare system, administered on the state level, as long as it is as comprehensive and as affordable as the federal plan. Vermont’s Senator Bernie Sanders supports the amendment, hoping that his state will become the first to create a single-payer healthcare system. Will the amendment create a loophole that will allow states to lead the fight for single-payer healthcare? 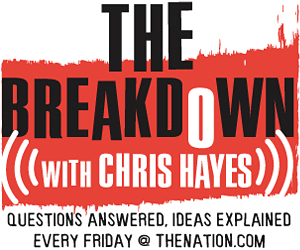 On this week’s episode of The Breakdown, DC Editor Chris Hayes talks to Washington Post columnist Ezra Klein about why blue states haven’t tried out single-payer systems already—even before healthcare reform was under consideration. Ezra Klein’s interview with Bernie Sanders on single-payer healthcare. Talking Points Memo post on Wyden and Brown’s healthcare proposal. Klein’s blog at Washington Post.